The National Research Council (NRC) has appointed Ford School Professor Barry Rabe to a steering committee that will organize two workshops examining the social and decision-making issues related to identifying, assessing, and managing risk in shale gas development. In the first workshop, experts and practitioners will identify key issues regarding shale gas development and discuss the state and limits of scientific knowledge on those issues. In the second workshop, social scientists from several disciplines will apply a variety of insights about risk management institutions to the shale gas case, while interacting with each other and with practitioners. The committee will produce a summary report of the workshops, as well as questions and considerations for future analysis. "Shale gas development poses far-reaching challenges and opportunities," Rabe said, "including many questions for state and local governments across the nation that are exploring policy options. I welcome this opportunity to join with a very distinguished and diverse set of scholars to begin to develop a national research agenda in this area." In recent years, natural gas extracted from shale rock has become increasingly significant to U.S. natural gas production. Its development using hydraulic fracturing ("fracking") technology remains the subject of debate due to a number of environmental, economic, and policy concerns, among others. 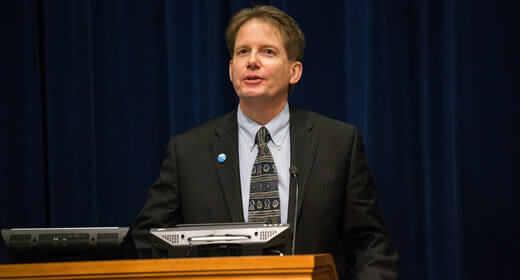 Barry Rabe is J. Ira and Nicki Harris Family Professor of Public Policy and Arthur F. Thurnau Professor of Environmental Policy at the Ford School, where he directs the Center for Local, State, and Urban Policy (CLOSUP). He is also a non-resident senior fellow of governance studies at the Brookings Institution. His research examines the adoption and implementation of policies relevant to climate change, environmental protection and energy, with particular attention to the role of state governments in the American federal system. He has co-authored an analysis of Pennsylvania's legislation to regulate the extraction of natural gas by hydraulic fracturing for an upcoming issue of Review of Policy Research. In November 2012, CLOSUP hosted the panel, "Shale Gas and Fracking: Issues for State and Local Governance" and will publish a report that presents the first cross-state comparison of public opinion on this issue, comparing responses to identical questions from Michigan and Pennsylvania residents. The National Research Council (NRC) seeks to improve government decision making and public policy, increase public understanding, and promote the acquisition and dissemination of knowledge in matters involving science, engineering, technology, and health.